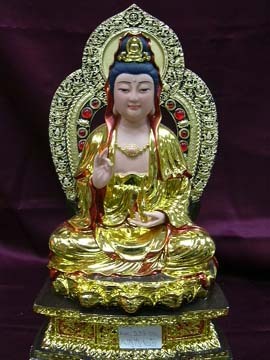 Samantabhadra( pu xián pú sà) means the Universal Worthy. He is a Bodhisattva in Mahayana Buddhism, together with Sakyamuni Buddha and fellow bodhisattva Manjusri he forms the Buddha trinity. He is the patron of the Lotus Sutra and made the ten great vows which are the basis of a bodhisattva. Known as Puxián in Chinese, he is regularly shown in feminine characteristics, riding an elephant while carrying a lotus leaf 'parasol'. Pu Xian manifests from love, kindness, diligence, patience, and holiness.Samantabhadra is the integration of awareness and emptiness, the unity of appearances and emptiness, the nature of mind, natural clarity with unceasing compassion - that is Samantabhadra from the very beginning. He is mostly honored by His followers for obtaining prosperity and longevity, and even regarded as a healer or protector from illness. 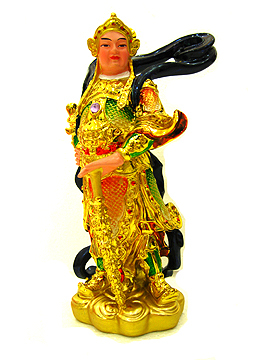 Bodhisattva Samanthabhadra is also the guardian deity of zodiacs dragon and snake. Those who are born in the years of dragon and snake can invite him home as the guardian angel. He provides great power in clearing obstacles and inviting wealth from endless resources when these zodiacs are going through difficulty and in great problems. This chinese style Kuan Yin is depicted sitting on a lotus, a sign of peace and harmony. The figurine is beautifully made from the finest earth material and its high quality finishing (from the most reputable manufacturer) is guaranteed to impress. This Goddess of Compassion (Avalokitesvara) will help you overcome sickness, family problems, relationship problems, career problem, conceiving problem, children problems, death of loved ones, all forms of stress, examination problems and other types of bad luck. This is the Kwan Yin the in supreme standing posture on the lotus. On her right, she is carrying a child. This Goddess of Compassion (Avalokitesvara) will help you overcome sickness, family problems, relationship problems, career problem, conceiving problem, children problems, death of loved ones, all forms of stress, examination problems and other types of bad luck. Made from bronze, this figurine promises a lifetime reliability. 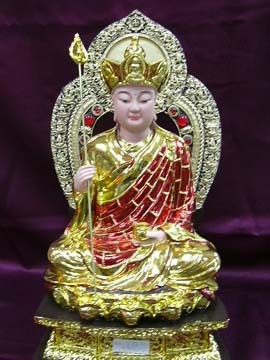 He is known as Di Zhang Bodhisattva in Chinese, Ksitigarbha in Sanskrit, and Jizo Bosatsu in Japanese. The Di Zhang has a great vow to not achieve Buddhahood until "all the Hells are empty". But his vow actually encompasses all sentient beings and to save sentient beings, even if he has to suffer retribution. 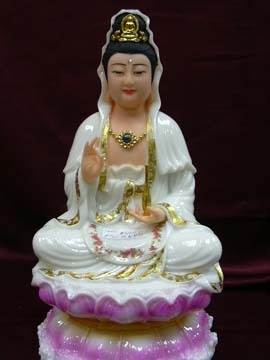 The popularity of Di Zhang is next to Kwan Yin among the Chinese. He carries with him the ALARM STAFF, considered as a symbol of goodwill, compassion and care. It sends out the message of how precious every living creature is and none should be sacrificed. One can display the statue to suppress Quarrelsome Star #3. The Alarm Staff is not a weapon. Instead it is a staff with rounded loops at the top with jingling rings that symbolizes peace, harmony and respect for all living realms. Its jingling rings are said to produce hyms that creates awareness. It is one of the eighteen treasures of Buddhism. It is normally carried by high practising buddhist monks (close to sainthood) to clear the pathway and warn small creatures (such as creeping life like ants) to make way so that they will not be stepped and killed. In ancient Sanskrit, it is called the "Khakhara" or "Hikile". This staff reminds those practising Buddhism to abstain from killing. If one feels that the energy in the home is overly quarrelsome, quickly invite this Buddha as antidote. 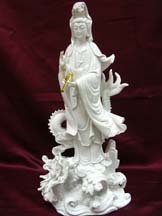 This chinese style Kuan Yin is depicted standing on a dragon, making it extremely powerful in enhancing the chi of homes. The figurine is beautifully made from the finest earth material and its high quality finishing (from the best porcelain manufacturer) is guaranteed to impress. Invite this Kuan Yin into your prayer hall to bring in ultimate blessings! 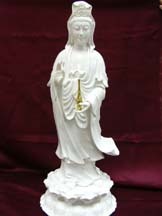 This chinese style Kuan Yin is depicted standing on a lotus, a sign of peace and harmony. The figurine is beautifully made from the finest earth material and its high quality finishing (from the best porcelain manufacturer) is guaranteed to impress. Invite this Kuan Yin into your prayer hall to bring in ultimate blessings! 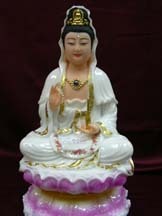 This is another exclusive chinese style Kuan Yin sitting on a pink lotus, a sign of peace and harmony. The figurine is beautifully made from the finest earth material and its high quality finishing is truely amazing.The color of her face and hands look like very much like real skin. Invite this Kuan Yin into your prayer hall to bring in ultimate blessings! This the most beautiful piece of chinese style Golden Kuan Yin statue sitting on a shrine with a beautiful back piece. The figurine is beautifully made from the finest earth material and its high quality finishing is truly amazing.The color of her face and hands look like very much like real skin. Her dress has a beautiful gold-chrome coating. Invite this Kuan Yin into your prayer hall to bring in ultimate blessings! While Kuan Yin vows to rescue all beings from mother earth, Tay Chong Ong vows to rescue all beings in the hell. 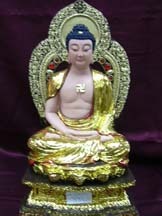 This the most beautiful piece of chinese style Tay Chong Ong statue sitting on a shrine with a beautiful back piece. The figurine is beautifully made from the finest earth material and its high quality finishing is truly amazing.The color of his face and hands look like very much like real skin. His monk-gown has a beautiful gold-chrome coating. Invite this Tay Chong Ong into your prayer hall to bring in ultimate blessings! The Buddha is the ultimate symbol of enlightenment, the symbol of awareness and the symbol of loving kindness. 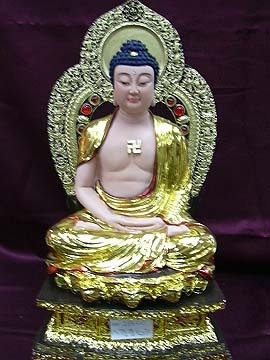 This the most beautiful piece of chinese style Buddha statue sitting on a shrine with a beautiful back piece. The figurine is beautifully made from the finest earth material and its high quality finishing is truly amazing.The color of his face and hands look like very much like real skin. His monk-gown has a beautiful gold-chrome coating. Invite this Buddha into your prayer hall to bring in ultimate blessings! 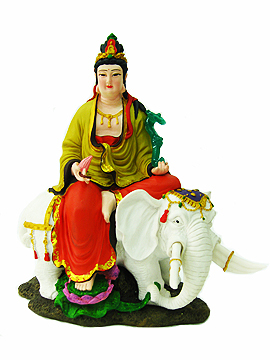 This Pu Sian statue depicts the deity sitting on the auspicious elephant. The deity holds a Ru Yi to signify harmony and authority. The statue is made from earth material and is hand-painted by skillful artists. This is a rare piece and hard to find item. Wooi Thor, being the counterpart of Kwan Kung in Chinese Temples, is another popular Buddhist deity. This the most beautiful piece of Wooi Thor statue standing with him holding on to his special sword-like weapon. The figurine is beautifully made from the finest earth material and its high quality finishing is truly amazing.The color of his face and hands look like very much like real skin.